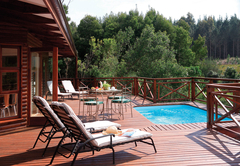 The Fernery Lodge & Chalets is a highly recommended B&B with self catering option, providing accommodation in Bluelilliesbush for tourists visiting the Tsitsikamma region. 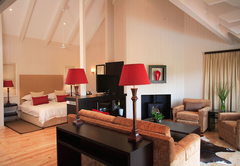 The Fernery Lodge & Chalets - naturally stunning, created luxury. 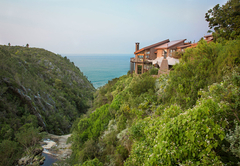 Imagine sitting above a 30-metre waterfall, with breathtaking views of a river gorge and the wild Indian Ocean. 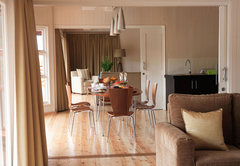 This is the setting of The Fernery Lodge & Chalets. 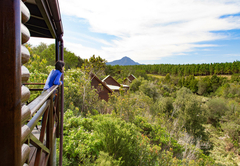 It is hard to decide whether to admire the incredible surroundings from the Lodge's deck area with the swimming pool, jacuzzi, sauna and gym, or to enjoy it from any one of the six deluxe suites. 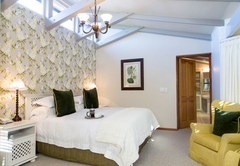 At The Fernery Lodge & Chalets each suite is tastefully decorated and every effort has been made to ensure our guests' comfort, from DSTV and an en-suite bathroom to a private deck with beautiful views. 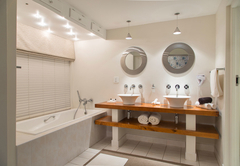 For complete opulence, try The Honeymoon Suite with its luxurious spa bath. At the end of a tough day relaxing, guests can wander through our wine cellar and select a bottle of wine before making their way to the Cellar Dining Room for excellent cuisine and an equally enjoyable atmosphere. 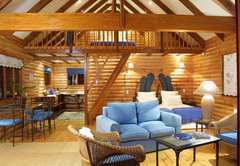 Children are welcome in the Chalets, but regrettably no children under the age of 12 years are permitted in the Lodge and dinner restaurant due to its ambiance. Experience the Tsitsikmma as if you were the first to discover it. 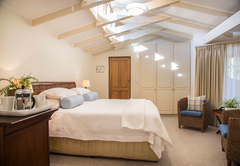 There are both B&B and self catering chalets, each beautifully appointed and privately located, so you can enjoy a peaceful paradise experience. 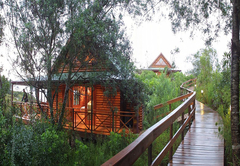 Relax in nature and treat your soul to views of mystical waterfalls, rock pools and the vast Indian Ocean. 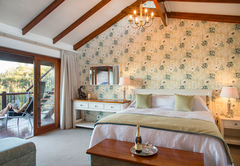 The B&B chalets sleep 2 in either twin or king size luxury, whereas the self catering chalets sleep 4 and have fully equipped kitchenettes, making them ideal for families - or choose one of the plush twin chalets (ideal for 2 couples) which offer en-suite bathrooms and private lounges, fully equipped kitchen and a private plunge pool on the deck. 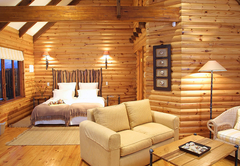 All the chalets are beautifully decorated and each chalet has a unique theme inspired by its magnificent surroundings. 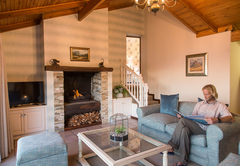 Enjoy the tranquility of the mountains and forests from the privacy of the sheltered deck or curl up in front of the cosy ceramic fireplace with a good book. 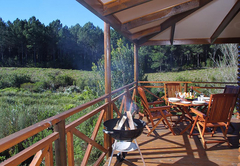 End off the evening with a barbecue on your deck - simply arrange beforehand and you will be provided with everything from the ingredients to the Weber. 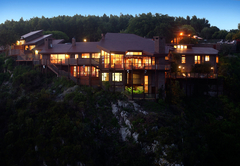 An entertainment area with dart board, satellite television and sauna, as well as a swimming pool, is at the guests disposal. 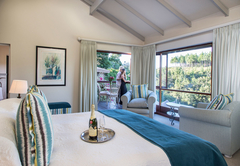 A large jacuzzi, perched on the edge of the river gorge, is a favourite with our guests, and can be enjoyed with a bottle of wine or champagne at The Fernery Lodge & Chalets. 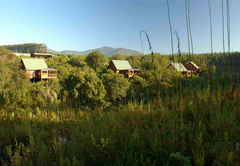 Bed & Breakfast; en-suite bathroom; tea & coffee-making facility; bar-fridge; flat-screen TV with limited DSTV bouquet; deck with sea/river view; complimentary welcome pack on arrival; lodge facilities includes jacuzzi, sauna & swimming pool. Children pay 100% of the rate. 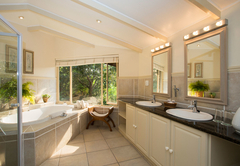 Bed & Breakfast; en-suite bathroom; tea & coffee-making facilities; bar-fridge; flat-screen TV with limited DSTV bouquet; lodge facilities includes jacuzzi, sauna & swimming pool. Children pay 100% of the rate. 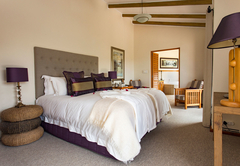 Bed & Breakfast; en-suite bathroom; open plan bedroom/lounge; tea & coffee-making facility; bar-fridge; gorge view; deck with braai facilities; use of communal recreational area & swimming pool; jacuzzi & sauna. 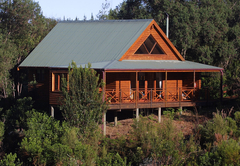 Open plan; 2 upstairs & 2 downstairs; 1 bathroom; fully equipped kitchen; tea & coffee facility; TV with limited DSTV bouquet; cosy fire-place; gorge view; deck with braai facilities; use of communal recreational area & swimming pool; jacuzzi & sauna. Children pay 100% of the rate. 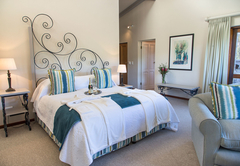 (2 bedrooms en-suite) Fully equipped kitchen; each bedroom with private lounge; flat-screen TV with limited DSTV bouquet; cosy fire-place; gorge view; deck with braai facilities & private swimming pool; use of recreational area; jacuzzi & sauna. 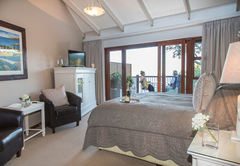 B&B; en-suite bathroom; private lounge and kitchenette; flat-screen TV with limited DSTV bouquet; deck with bbq facility; stunning sea and gorge views; complimentary welcome pack on arrival; lodge facilities includes jacuzzi, sauna & swimming pool. Children pay 100% of the rate. 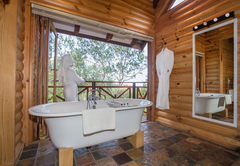 Bed & Breakfast; en-suite bathroom; tea & coffee-making facility; bar fridge; flat-screen TV with limited DSTV bouquet; view over the gorge and plantation; complimentary welcome pack on arrival; lodge facilities includes jacuzzi, sauna & swimming pool. Children pay 100% of the rate. 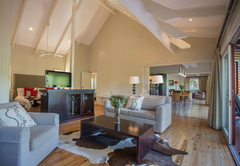 I was absolutely blown away with the view, the interior, the spacious and beautiful room. The food - absolutely excellent. The four course dinner is a must! The breakfast was also delicious. The best omelet I ate in a long time. The staff is very friendly and helpful. I will most definitely visit the place again. 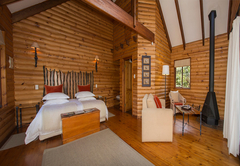 The rates really good comparing with other Lodges in the area which are not nearly as good as The Fernery. In fact cannot compare at all. 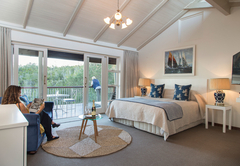 Response timeThe Fernery Lodge & Chalets typically responds to requests in 5-10 minutes.